Blast from the Past was a great read. I love her work! She has everything set right, and it makes me want to go out and read the rest of the series! The story flowed fairly fast, and was really good. She had about 3 (maybe 4) different stories going all connected to the main one. It got pretty intense, and I loved the end result. I give this book 5 out of 5 book-a-saur paws. I was fortunate enough to have an interview with her! Here is the interview. Me: What inspired you to write Blast from the Past? 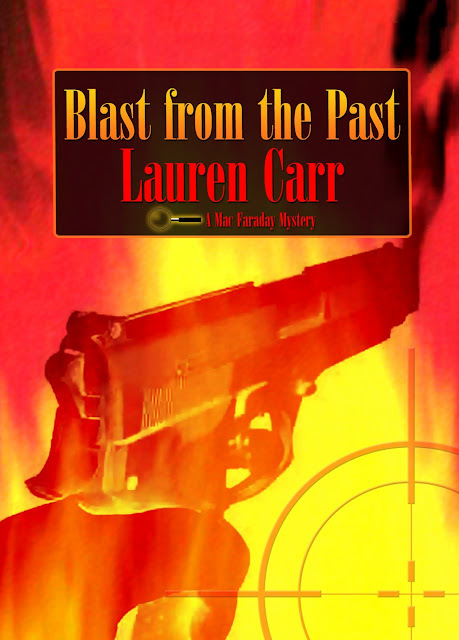 Lauren: Blast from the Past is the fourth installment in the Mac Faraday Mysteries. During the course of the series, Mac and Archie, the lovely nymph living in the cottage on his estate, have been getting closer. So I knew in this book I wanted to get more into the character of Archie, whose past I have kept a secret. In Blast from the Past, I reveal that past. Readers discover that is in the Witness Protection Program after having witnessed a mob hit, and testifying against the mobster to send him to jail. Now ten years later, the mobster is out and is seeking revenge by coming to Spencer to personally supervise Archie's execution. My goal in this book was to reveal more of Archie's personality. She is a strong woman, but she is also able to lean in Mac. Me: Have you always wanted to be an author? Lauren: Yes, I have always wanted to be an author. when I was a child and I would read books, I would rewrite them in my head to make them better. Me: How long did it take you to write last from the Past? Lauren: I started working on it last summer, after Shades of Murder was released in May. it was released in January--so it took six months from start to finish. I have found that over the years, my writing has gotten tighter and I can write faster. Maybe it is because my characters in this series are set. I spend a lot of time thinking about a book before starting to write it. Me: Between all of your Mac Farady books, which one is your favorite? Lauren: My favorite Mac Faraday mystery is always the latest one. But I have to say I am most proud of Its Murder, My Son, followed closely by Blast from the Past. I really like how ARchie has jelled as a character. I also love the subplot of Gnarly and Sari. Me: Will there be more to the series? Lauren: Oh, yes! I am working on the next Mac Faraday to come out in September. The working title right now is Murders at Astaire Castle. In this book, Mac discovers that he is the owner of a haunted castle in which a famous horror author had mysteriously disappeared and several people were murdered. This is my "paranormal". I put that in quotes because there is a horror element to it, but I am not going into the paranormal field. Nothing against paranormal authors or readers. I'm just not a paranormal author. I will continue writing Mac Faraday as long as he wants me, too and it is fun. I have another series, the Lovers in Crime, who I had introduced in Shades of Murder. I am working ont he next installment in that series, and have plans to bring Joshua and Cameron back to Deep Creek Lake for another mystery with Mac. And Gnarly! We can't forget Gnarly. Me: When you finished writing the first Mac Faraday book, did you feel obligated to write a second one? Lauren: Not obligated. Driven is the word. I really liked these characters and wanted to explore them more. Surprisingly, Gnarly was not in the first draft of It's Murder, My Son. he showed up in later drafts. This series is very different from the first drafts. In the first draft, Robin Spencer was alive and Mac Faraday's wife. Gnarly did not exist. Also, the setting was Pelican Lake, Wisconsin. Me: Is there any book that inspired you to write the series? Lauren: I had set the book that at the request of my sister-in-law who wanted a mystery set in her vacation home town. But she did not like that I set the murder in her house so I moved it. I decided to kill of Robin Spencer because her character was nothing more than a devoted wife telling Mac how smart he was. Gnarly was inspired by my Australian Shepherd who is extremely smart and cute. So he was broadened. My inspiration is the classic mysteries that I grew up with. I love the classic whodunits. Like in the old Ellery Queen books where they would have a blank page and say, Now you have all the clues. Who's the killer? I love the thin Man series. That was who I was striving for with the Lovers in Crime. My inspiration for Mac comes from a lot of areas and I can't pick exactly which one. Me: And lastly, what is your favorite book? Lauren: That is very hard. I think it would have to be Agatha Christie's Mousetrap or And Then There Were None. And Then There Were None because I remember being very young when I read that and I recall thinking, "Wow! What a twist. I would love to be able to write like that." Mousetrap is because years ago, I read in an interview where Agatha Christie said there was a mistake in that mystery. But she didn't say what it was. So i have read that book over and over again and can't find it. My current favorite author is Tess Gerritseon. Me: Great! Thanks for taking your time to let me ask these questions. BLURB: In this fourth mystery on Deep Creek Lake; Mac Faraday finds himself up to his eyeballs in mobsters and federal agents.